Teeth sensitivity doesn’t have to be the name of the game in getting whiter teeth. My teeth get very sensitive after I use whitening strips, but I love white teeth, and have no intentions of stopping the whitening, so I had to figure out how to stop teeth sensitivity. First, I changed my whitening process so it’d be less frequent, and equally effectively. 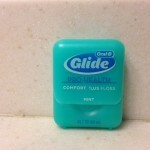 Then I bought a great sensitive toothpaste, the Colgate Sensitive Pro-Relief. It works better than any of the other sensitive toothpastes I’ve tried, and doesn’t leave that baking soda after-effect feeling in your mouth. 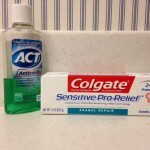 In addition to the toothpaste change, however, is the addition of ACT fluoride rinse, which seems to add another layer of protection from the sensitivity. I still do get teeth sensitivity after whitening, but with the addition of the ACT and sensitive toothpaste, I was able to stop the teeth sensitivity, or at least lessen it dramatically. I do try to take good care of my teeth with regular flossing with my favorite OralB Glide floss, and brushing twice a day with an electric toothbrush to help make sure I’m cleaning my teeth well – especially those back teeth! Looking for the whitest teeth in town? Check out my post on the Best Teeth Whitening Strips.